ST. GEORGE — A St. George couple are facing more than 15 felony charges each after a five-month crime spree came to an abrupt halt when the pair were arrested for forgery, mail theft and myriad other offenses. Kathleeen Maestas, 32, and Chaz Wendt, 32, were arrested following an investigation that began Jan. 8 when officers responded to reports of a series of mail thefts at an apartment complex in the 500 block of South 1990 East in St. George, according to St. George Police officer Tiffany Atkin. A particular room key was used to access the mailroom when the alleged thefts took place, court records say. The detective went to the room number assigned to the key and spoke to the resident who identified herself by a different name, but the officer determined later through booking photos that the woman was actually Maestas. The detective returned the next day and Maestas provided her cousin’s name and birth date. The ruse was quickly revealed and she was arrested and transported to jail for outstanding warrants and for providing false personal information of another to officers. Meanwhile, Wendt was located during a search of the apartment subsequent to Maestas’s arrest. He was taken into custody and transported to jail on outstanding warrants while detectives continued the mail theft investigation. The apartment’s security footage revealed a man matching Wendt’s description “stealing mail from the mail room in the apartment building where he lived,” the detective said in the statement. On the day of arrest, officers searched the couple’s apartment where evidence connected to the reported mail theft was discovered, including several empty shipping boxes with the address of the apartment complex listed but with names and apartment numbers that did not belong to either Maestas or Wendt. Officers matched the information from the empty boxes to the actual recipients listed on the shipping labels and determined that more than $300 in items were reportedly stolen. Maestas appeared Thursday in 5th District Court on second-degree felony identity fraud and seven third-degree felony charges, including one count of identity fraud; possession of another’s identifying documents; two counts of possessing a forgery/writing device and five counts of unlawful acquisition of a financial card without consent, according to documents filed with the court. Maestas was also charged with obstructing justice, providing false personal information with intent to be another actual person and two counts of mail theft, which are class A misdemeanors. She was charged with class B misdemeanors for shoplifting, drug possession and possession of paraphernalia, both class B misdemeanors. Wendt was charged with eight third-degree felonies, including five counts of unlawful acquisition of a financial card without consent; possessing a forgery/writing device; possession of another’s identifying documents and obstructing justice. He also faces two misdemeanor counts of mail theft, and one count each for drug possession, possession of paraphernalia and giving false personal information identity to a police officer, the record shows. Wendt refused to make a video appearance Jan. 11, and the next appearance is scheduled Jan. 23 at 1:30 p.m. The couple were arrested Sept. 20 after officers responded to the Chevron gas station on Riverside Drive on a reported family fight involving a couple, later identified as Maestas and Wendt out of Las Vegas. During the argument, a bystander told police Wendt slashed two tires on a large commercial moving van. Officers also found both passenger-side tires on a U-Haul commercial van slashed. Officers questioned the couple and during a search of Maestas’ purse they found a financial card in another individual’s name. 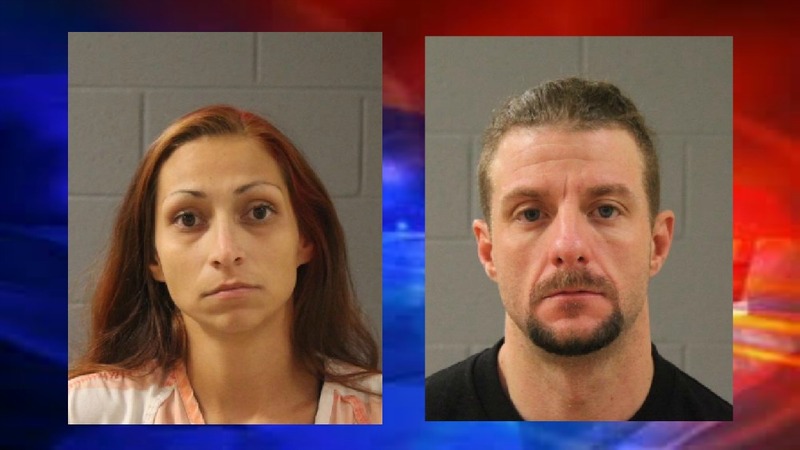 They obtained a warrant for the U-Haul and found a bag containing eight debit cards that were not in her name, along with what appeared to be methamphetamine as well as paraphernalia. Later, officers were given documents that were left in the women’s restroom at the gas station, including a check and other financial documents in other individuals’ names that did not belong to Maestas. Wendt was also questioned, and during a search of his backpack officers located four large folders containing credit applications in different names with other personal information that did not belong to him. Wendt claimed the files belonged to his co-defendant, Maestas, who claimed they were Wendt’s. Both were arrested and transported to Purgatory Correctional Facility. Maestas was charged with 11 third-degree felonies, including nine counts of unlawful acquisition of a financial card without consent, possession of another’s identifying document and forgery. She was also charged with two misdemeanor counts of drug possession and possession of paraphernalia. Wendt was charged with four third-degree felony counts of possessing a forgery/writing device and one misdemeanor count of criminal mischief for slashing the truck tires. After spending nearly two months in jail, Maestas was released and a warrant was issued after she failed to appear in court for arraignment this month. A warrant for Wendt was issued Oct. 22 after he failed to appear for a preliminary hearing. Well done, St George PD detectives and others who may have assisted in the incarceration of these two thugs. lol, wouldn’t celebrate just yet, m&m. They likely be right back out and back at it in no time. Wow it looks like this couple actually moved from Las Vegas to St. George just to do some serious thieving. I guess they figure the pickings are easy around here. It could see how someone might get that idea, with all the older folks around, the slow pace of things, the police for the most part staying out of people’s business and letting them live their lives. But people just don’t realize that the St. George Police Department is world-class when it comes to three things – finding narcotics, clearing traffic accidents off the road, and tracking down thieves. Does the court system have any advice for what we should do when these degenerates are inevitably released after a slap on the wrist? How should we protect ourselves from these animals?